Bubbles is an action game with puzzle elements where the player controls the protagonist, a soap bubble, from a top-down perspective. The object is to clean a kitchen sink by maneuvering the bubble over ants, crumbs, and grease to absorb them. The player is impeded by enemies - brushes, razor blades, roaches, and sponges - that are deadly to the character. The bubble will grow larger the more objects the player absorbs. Once the bubble reaches a certain size, it will acquire a smiling face and becomes invulnerable against some enemies; contact with those enemies, however, will reduce the bubble's size to the point it becomes vulnerable again. After cleaning the sink, the player will progress to the next level. If the bubble becomes large enough, the drain in the center of the sink will begin to flash, signaling the player to enter it to progress to the next level. 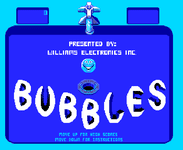 Source: Wikipedia, "Bubbles (video game)", available under the CC-BY-SA License.